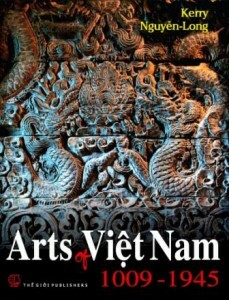 Arts of Việt Nam 1009-1945 by Kerry Nguyễn-Long, is the only book written in English on this subject. It covers the development of the arts from the first Lý king in 1009 to the abdication of the last Nguyễn King in 1945, from the North to the far South of Vietnam. The Vietnam Foundation had the honour to host on Sunday 5 May 2013 a presentation by author Kerry Nguyễn-Long about this valuable, important publication. Kerry Nguyễn-Long has a long connection with Vietnam and has been writing on its arts for decades. Since 1999 she has been a contributing editor of the international bimonthly magazine Arts of Asia, published in Hong Kong. Her writings have also featured in many books, arts magazines, museum catalogues, and journals. Supported by over 300 illustrations, the Arts of Việt Nam 1009-1945 introduces major categories of the arts from Architecture to Sculpture, Stone and Woodcarvings, Metalcrafts, Lacquercraft, Furniture, Ceramics, Inlay work, Woodblock Printing and Painting. It presents them in historical context, describes their features in each period and explains why alongside enduring continuities new styles emerged while others were abandoned. Kerry’s talk was very informative, well illustrated with many slides and drew very lively queries and discussions from engaging, interested audience. The book talk was followed by a beautiful recital of Vietnamese classical music items with đàn Tranh (16-stringed zither) and đàn Bầu (monochord) by artist Ngọc Anh and her student. The audience of more than 40 members and friends of the Foundation enjoyed a very rewarding cultural event and purchased many copies of the book. Kerry kindly donated part of the proceeds of the sales of the book to the Vietnam Foundation’s fund for aid projects in Vietnam. The book is available for $55 from many arts bookshops. Its publication was supported by the Australian Embassy in Hanoi as part of its programme to celebrate the 40th anniversary of diplomatic relations with Vietnam. It has been awarded a certificate of commendation for the 2013 Australian Arts in Asia Awards by the Australian Government Minister for the Arts.